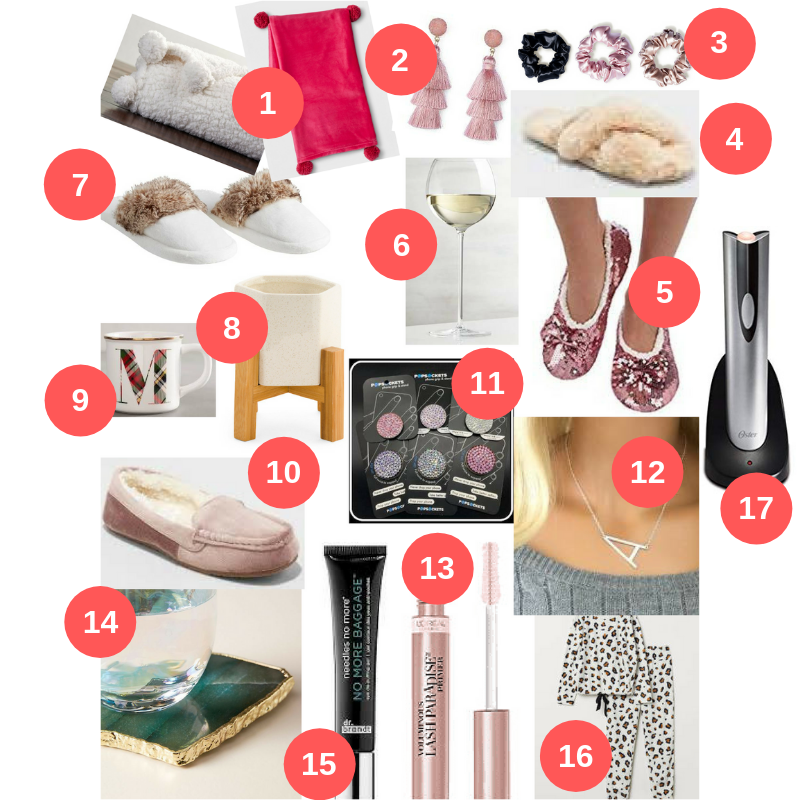 This gift guide is for all the 'hers’ in your life! Sisters, aunts, moms, girlfriends, wives, friends… you name it! Under the photo are all the items in the photo listed 1-16. There are direct links to shop each item listed! What are some of your favorite gifts to buy the girls in your life? Please share on this post! I hope this post helps you on deciding what to get those special gals in your life! 1 - Pom Pom Blanket This plush one and this sherpa one would make amazing gifts! I love the pom pom detail on them. 2 - Tassel Druzy Earrings I get so many compliments on these every time I wear them. They come in almost every color and are under $15! 3 - Silk Scrunchies Or this cheaper one from Amazon. I recently got silk scrunchies to tie my hair up with every night because they don’t pull or create bad creases in my hair when I wake up, and they stop the breakage that normal hair ties cause. 4 - Fuzzy Slippers These come in lilac and black as well, and I wear them every single day in my home! They keep my feet toasty and I love them because they aren’t chunky or hard to walk in. Also, they are under $20! 5 - Sequin Bow Slippers I have these pink slippers and they are so cute for sleepovers. They are super lightweight but have a soft sherpa inside and are perfect for the girly girl! 6 - Wine Glasses My all time favorite wine glasses are these Camilla glasses from Crate and Barrel! They have a long stem and a big bowl which I love and think they look so elegant. I have two red wine glasses and two white wine glasses from this line! 7 - Faux Fur Slippers I love these for an aunt or mother-in-law because they are a classic slipper with a touch of faux fur. These will go with any PJ set and be nice and cozy for the woman always on her feet! 8 - Decorative Candle This is a perfect coffee table centerpiece for someone who likes candles and unique decorations. 9 - Alpha Mug Any one who drinks out of a mug will love this personalized mug! And it’s under $5- perfect gift! 10 - Driving Slipper These fur lined slippers have a sole on the bottom so your favorite gal can wear them outside and inside! Under $20. 11 - Crystal Popsocket Do you know a gal with a giant phone? Popsockets are perfect because you can place them anywhere on the back of your phone or phone case and it helps hold the phone more securely in your hand. These are just even better because they are covered in Swarovski crystals! 12 - Large Alpha Necklace Or spelled out word/name necklace can be completely personalized to say whatever you want! I have the large alpha necklace in gold with a J for my first name, but a lot of girls get an initial necklace in their kid’s first names or their new married last name if they are newly weds. 13 - Mascara Primer This primer does wonders when applied under mascara, and it moisturizes the lashes as well for the girl who wears mascara almost daily! 14 - Agate Coasters I got these for Christmas last year and they are one of my favorite gifts! I love the Anthropology agate products and these make such a pretty statement on end tables or on a coffee table. 15 - No More Baggage Eye Cream For the lady who stays up too late and works too hard! Just remember to tell her she doesn’t have bags when you give this to her ;) Preventative care for the woman who does it all! 16 - Fleece loungewear Or these printed knit pajamas or this sherpa pullover are perfect options for a cozy gift! Who doesn’t love being comfy? Some of my favorite presents have been cozy pajamas and cozy pullovers. 17 - Electric Wine Opener After a long day, all you want is to get into that bottle of vino ASAP. This electric wine opener saves lives. Don’t worry about screwing anything into a cork and struggling with it, just put this baby on top of the wine bottle, press a button, and with literally zero effort you have yourself an open bottle of love and relaxation.